March Madness Comes to Heritage! Heritage held our 16th annual free throw contest. Every year on the Friday before the national championship game, employees from different departments compete in a friendly free throw contest. Congratulations to Jessica who took the most shots without missing a single one! We are proud of our very own superstar! This entry was posted in Company Fun on July 26, 2017 by digitalhill. 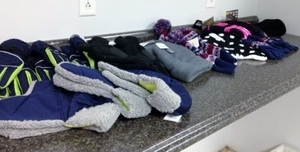 Our Account Representatives wore jeans the week of December 21st through December 28th to raise money to purchase hats and gloves for Faith Mission of Elkhart. The department raised $165.28 to go towards these items. This entry was posted in Giving Back on July 26, 2017 by digitalhill. Heritage raised over $349 and had many items donated to our holiday Adopt-a-Family project. All items were wrapped and hand delivered to the Baugo Lions Club on December 17th! Congratulations to our account representative, Zoey, on recieving the most positve customer reviews for November! Here at Heritage Acceptance Corporation, we strive for excellence in customer service. We are so happy to have Zoey as part of our team! This entry was posted in Peak Performer on July 26, 2017 by digitalhill. 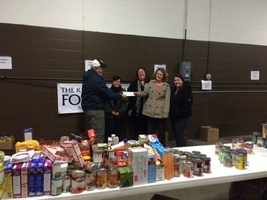 On December 3rd, Heritage Acceptance Corporation presented Knights of Columbus with a $325 check and bags of food for their annual holiday food drive. Heritage allowed employees to wear jeans the week of Thanksgiving for a donation to this cause. Heritage assembled for our 4th annual costume contest Friday, October 30th. 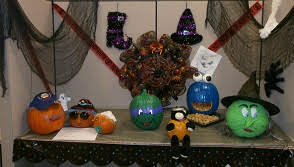 We also held a pumpkin decorating contest. It was a fun day in the office filled with cheerfulness and camaraderie. Heritage Acceptance Corporation (Heritage), a finance company specializing in purchasing automotive retail installment contracts, announced today that Mike Monaghan has been named vice president, sales and marketing. Monaghan brings significant experience developing new business opportunities and managing teams with proven success. He led the development of new products and implemented new technology solutions to exceed revenue projections and expand market penetration. Monaghan has a history of increasing sales volume and income in previous roles within the financial services sector. A native and resident of Dayton, Ohio, Monaghan earned a bachelor’s degree in business administration, with a major in finance, from the Ohio University. This entry was posted in Updates and Changes on July 26, 2017 by digitalhill. Heritage will be participating in the Juvenile Diabetes Research Foundation’s Walk to Cure Diabetes again this year. Established more than 25 years ago, Heritage is a finance company that specializes in purchasing automotive retail installment contracts through a network of over 600 dealers throughout the Midwest. Excellent service and a common sense approach are hallmarks of the Heritage experience. For more information, visit www.heritageacceptance.net or call 574.522.9598. Meet the Heritage Award of Excellence winner! Congratulations to Nora Kasa on being selected as this year’s recipient of the annual “Heritage Award of Excellence”. This award is given annually to a team member who exemplifies the values upon which Heritage was founded, along with a postive attitude and willingness to go above and beyond to help her fellow co-workers. 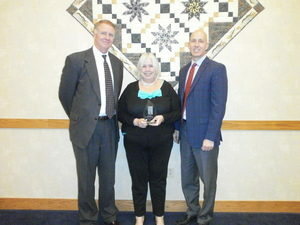 As part of this award, Nora and a guest will travel with the Heritage Executive Club on their annual trip. Congratulations to Nora on this well-deserved award!